This comforter is beautiful and colorful, The colors really brighten the room. It didn't come with bed skirt so I purchase a coral bed skirt to go with it. Highly recommend. Coco Paradise is a tasteful tropical print on a super soft cotton. 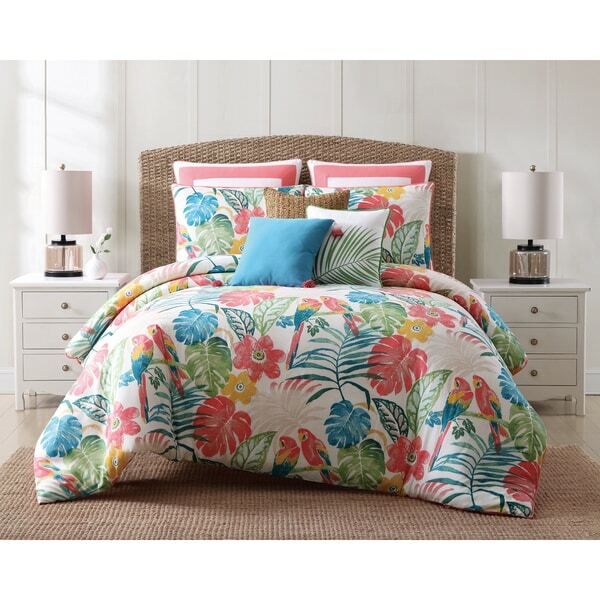 Build your bedroom around this tropical inspired printed cotton comforter set. 100-percent cotton shell, oversized. Imported. Machine washable. I ordered a King size bedspread to go on a queen size bed. It looks very awkward, too short lengthwise and too wide for the bed. I also received king size pillow shams and have smaller pillows. I can't put the bedspread on side ways because the birds on the print should be going from top to bottom. So, keep that in mind when you are ordering this bedspread in a size bigger than the bed. I'm going to have to return it and start over. Nice quality comforter for the price. Colors are bright and cheery. Very colorful and comfortable for our bedroom! Very high quality. We've got lots if compliments on it! Love it Thank you! One of the prettier sets I have purchased. Just beautiful. I really liked the colors. They popped and really brought my room alive. I am so glad I purchased it. I would recommend it to my friends or anyone else. Colors not as bright as I expected. The material that this is made out of feels like sandpaper. "Is it soft, warm and is it big enough for a cal king mattress?" "this is pretty but the colors look kind of washed out and something is missing. are they kinda washed out?" "I would like to purchase the coral and white sham which is pictured behind the oceanfront sham.R these available?Thank you!" "Where is the pillow with the palm leaf on it?" That pillow can be found under item number 22279998.